It is just before midday at the Halal Restaurant, the East End’s oldest Indian restaurant, and Mahaboob Narangali braces himself for the daily rush of curry hounds that have been filling his dining room every lunchtime since 1939. On the corner of Alie St and St Mark’s Place, occupying a house at the end of an eighteenth century terrace, the Halal Restaurant has plain canteen-style decor and an unpretentious menu, yet most importantly it has a distinctive personality that is warm and welcoming. 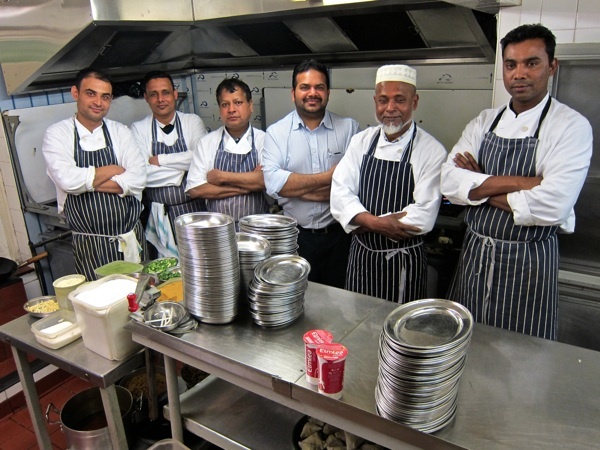 For the City workers who come here between midday and three each day – nipping across the border into the East End – the Halal Restaurant is a place of retreat, and the long-serving staff are equally comfortable at this establishment that opens seven days a week for lunch and dinner but only get busy at lunchtime on weekdays. 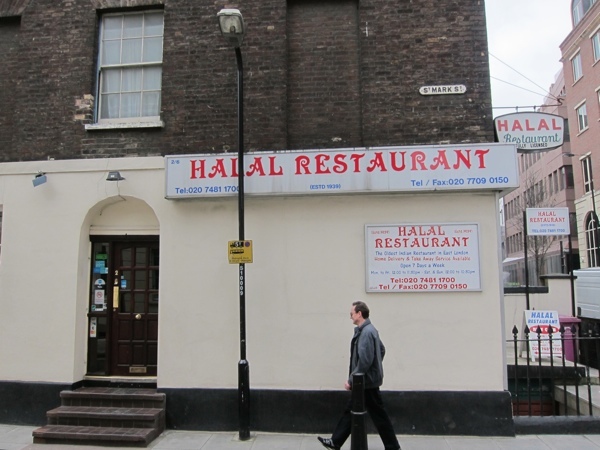 Stepping in by the modest side door of the Halal Restaurant, it is apparent that the small dining room to your right was the original front room of the old house while the larger room to your left is an extension added more recently. The atmosphere is domestic and peaceful, a haven from the nearby traffic thundering along Aldgate High St and down Leman St. Even though midday was approaching, Mahaboob was happy to talk to me about his beloved restaurant and I was fascinated to listen, because I realised that what I was hearing was not simply the story of the Halal Restaurant but of the origin of all the curry restaurants for which the East End is celebrated today. 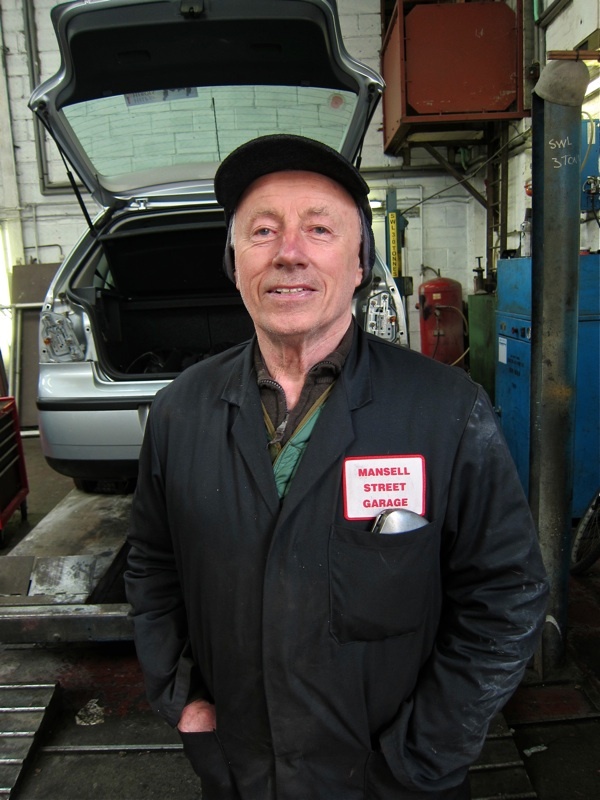 “Usman, my father, started working here in 1969. He came to Britain in the merchant navy and at first he worked in this restaurant, but then he became very friendly with the owner Mr Chandru and soon he was managing all three restaurants they had at that time. The other two were in Collum St in the City and in Ludgate Circus. 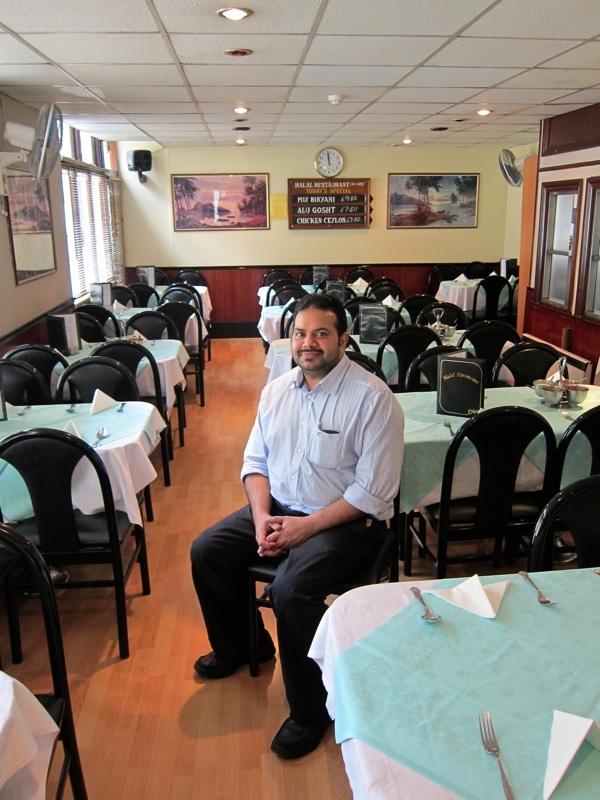 Mr Chandru was the second owner, before that was Mr Jaffer who started the Halal Restaurant in 1939. Originally, this place was the mess of the hostel for Indian merchant seamen, with rooms up above. They cooked for themselves and then friends came round to eat, and it became a restaurant. At first it was just three kinds of curry – meat, meatball or mince curry. Then Vindaloos came along, that was more spicy – and now we sell more Vindaloos than any other dish. In the early nineties, Tandoori started to come in and that’s still popular. 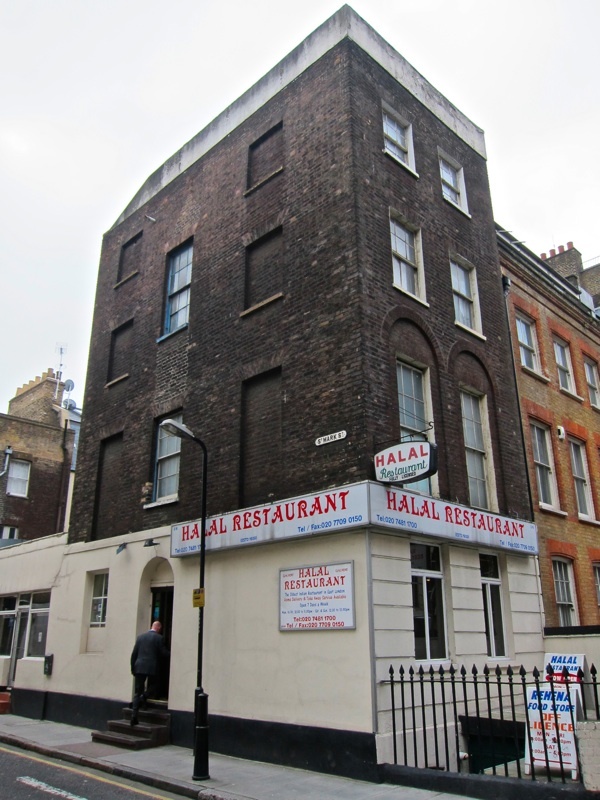 Held in the affections of East Enders and City Gents alike, the Halal Restaurant is an important landmark in our culinary history, still busy and still serving the same dishes to an enthusiastic clientele after more than seventy years. Of the renowned Halal Restaurant, it may truly be said, it is the daddy of all the curry restaurants in the East End. 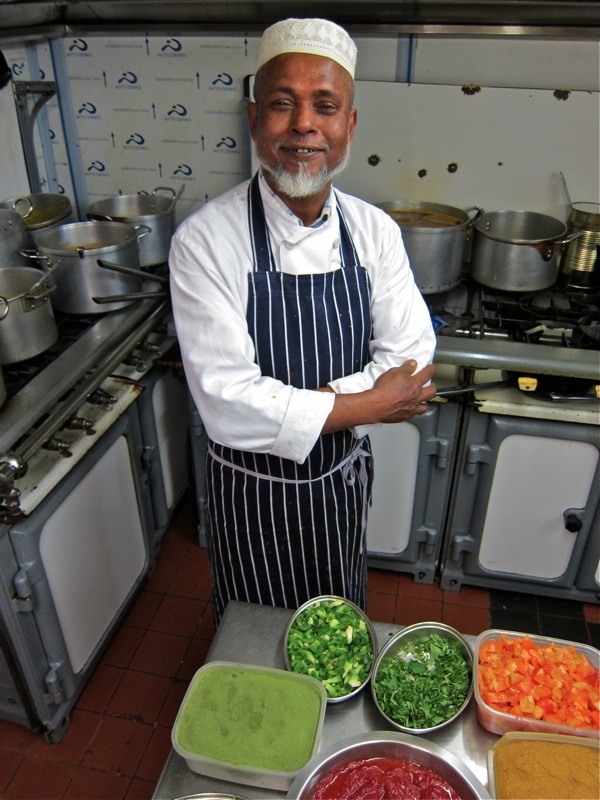 Asab Miah, Head Chef at the Halal Restaurant, has been cooking for forty-two years. 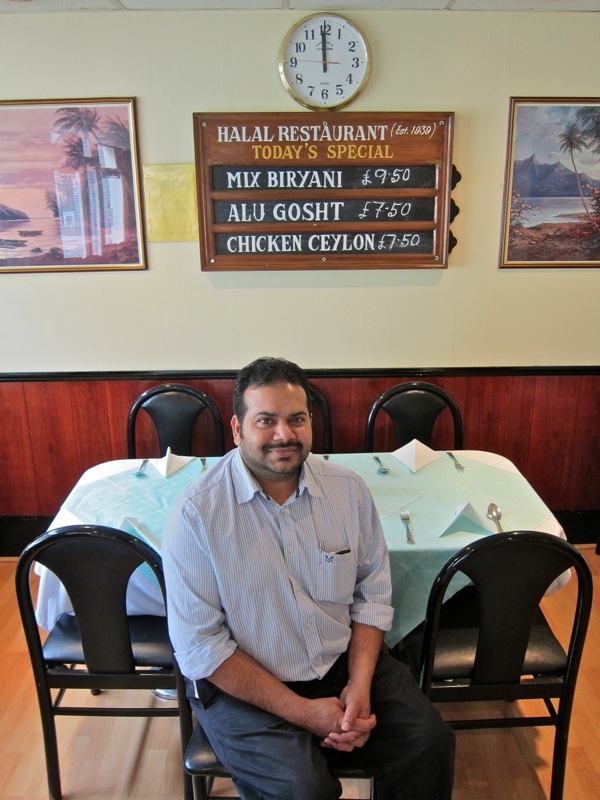 Originally at the Clifton Restaurant in Brick Lane, he has been at the Halal Restaurant for the last nineteen years. Quayum, Moshahid Ali, Ayas Miah, Mahadoob Narangoli, Asab Miah and Sayed. At 12:01pm, the first City gent of the day arrives for curry at the Halal Restaurant. Abdul Wahab, Mohammed Muayeed Khan and J.A. Masum. At 12:02pm, the second City gent of the day arrives for curry at the Halal Restaurant. Mahaboob Narangoli, owner of the East End’s oldest Indian restaurant. Now that’s a story. Getting stuck into a curry, in a place with such tradition and one that the local community holds so dearly, must make it taste all the more better! Hello, I think it opens in the evening too. I’ve been recently. It would be a shame for readers to miss out because they couldn’t go in the day. My Dad, who is Indian, used to go to the Halal too, but one of the other branches, in the 60s. He speaks very fondly of it – I need to take him there again. Great piece – loved the bit about Maurice Courtnell. Feel I should point out though that the Halal is very definately open 7 days a week and is open in the evenings. It’s become a regular haunt of mine these last couple of years when I’ve been finding myself more and more the other side of Aldgate East of a Friday night. We used to live next to Halal Restaurant and we love Mahaboob and his restaurant. His ginger chilli chicken is just the best! I feel like a rank amateur fan with only 12 year’s custom at Halal. 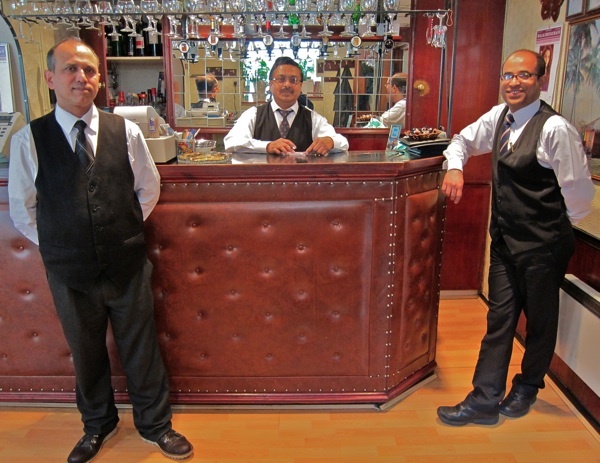 The staff at Halal are adorable and I look forward to many more years of fantastic food and service. a seamens’ hostel is one of the best, if not the best, budget place to stay in NYC. so i am curious about the indian seamens’ hostel and their making their way in the east end. i wonder if there are any left and if they would talk to you? btw, you will recall i have been clamoring for bangladeshi recipes and i just received a bunch in the lovely spitalfields city farm Coriander Club Cookbook. thrilled. i’m thrilled. thank you for turning me on to all of this. What a lovely story – thank you all! I’ve been eating at the Halal for over 20 years (my dad over 40 years). The deco may be dated but the staff are very friendly and the food is awesome. Every dish has a very distinct, authentic flavour and these flavours are never drowned out regardless of the ‘heat’ of the dish. I would recommend the plain mutton curry as a great place to start. The Karahi chicken and Tikka dishes are also very very good but to be honest there are so many excellent dishes on the menu. I had my first ever curry in this place – the meatball curry is legendary! We often used to pop along for an extended lunch from my office in Prescot St.
A new addition on my to do list for my next trip to the UK. Best curry house in the area, by far! I have been a customer for 25 years, quite simply the best curry you will ever have. The food is not coloured green red orange yellow it is curry served simply the best. Go and find out how good this place really is from the value to the service and how packed with all nationalities. Simply the best guys as you know keep going don’t ever let it go. Perhaps move closer to lloyds but if that happens I would end up a little larger and I can have that. I dined at this restaurant last night, and was really thrilled by the experience. I’d not heard of it before, and when we walked in around 7.30 pm, it was empty save for a table of three. I was tickled by the menu – just the names of dishes, no explanations – and the service was miles better than what you’d get in Brick Lane. A few other people walked in later, and our server took great pleasure in pointing out a gentleman who’d been visiting them for 66 years. Utterly amazing.